Very well done indeed to all 64 pupils in Year 6 who have worked amazingly hard this week on their SATs. They approached each day with calm positivity, and were mature in how they prepared for the challenges the tests brought along. Massive thanks must go to all of the staff who made the SATs week run so smoothly. Obviously, we start with the 4 colleagues in the Year 6 teaching team, but also this week for the assistance given by the learning support staff from across the school and to the kitchen for preparing mountains of toast to welcome the Year 6 pupils in from 8:00am. The hard work is not over for the oldest pupils at St Peter’s just yet, but looking ahead there is a list of dates relevant to Year 6 families, Year 5 families, and the Year 6 show which is open to all families at St Peter’s, even if they don’t have a child in Year 6. On Friday this week the school hosted Alan Mak, MP for Havant. Mr Mak has visited almost every school in his constituency, so we were delighted to be able to respond to his offer of a visit for the benefit of our pupils. Mr Mak spoke to our Year 6 cohort about the role of an MP and took questions on issues that were important to them. This was a great opportunity for the pupils to prepare for their own visit to Westminster in June, where Mr Mak will play host to our Year 6. Before receiving a guided tour of the school by a small group of pupils, Mr Mak listened to a presentation from our Year 5 Prayer Garden project team, and as a result has committed to making a donation to this pupil led enterprise. Year 6 & Year 5 Mass at The Church of the Sacred Heart and St Peter the Apostle in Waterlooville, Tuesday 19 June at 10:30am. All families welcome. Year 6 Performance ‘Annie’ at Oaklands Catholic School auditorium, Wednesday 11 July at 6:30pm. All families welcome, ticket information to follow. As usual following a Bank Holiday, we have managed to squeeze 5 days’ work into 4 at St Peter’s. Whole school worship was moved to Tuesday, and Year 1 hosted a Liturgy in which they expertly re-enacted the entire Easter story. Coming just before the Feast of the Ascension, it was a wonderful opportunity to reflect upon the Passion and Resurrection of Christ before the Church returns to Ordinary Time. Thank you to the Year 1 staff for preparing the children, to the families who attended, and to Monsignor Jeremy who joined the children. Pupils in Year 2 have been working very hard all week their end of Key Stage SATs, which are referred to as ‘quizzes’! The children have not been fazed at all by these, and the Year 2 staff team have worked wonders in energising and encouraging the pupils so that they show the full extent of their learning and skills. It is the turn of Year 6 next week to complete their SATs from Monday to Thursday. They too have worked exceptionally hard for these, and their teachers have prepared them in the best possible way. My advice for the weekend would be that rest and relaxation is just as important as revision when done in the correct amounts before any tests. I got to bring my toys into school today, even though it wasn’t the last day of term. The special reason? Well, today is Star Wars day of course; May 4th be with you! 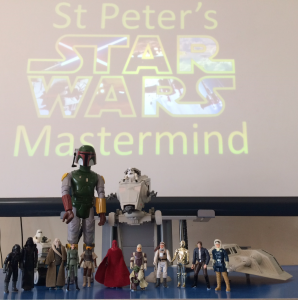 My assembly took the form of a Star Wars quiz, and I brought in my own Star Wars toys from when I was a primary school child, shown in the picture below. It was wonderful to see the younger pupils nearest the front of the hall unable to contain their curiosity about toys which are 35 years old and pale in comparison to what is available to them today. The main message of the assembly was twofold. Firstly, a film franchise that has lasted over 40 years, employs thousands of people across the globe and grosses billions of pounds in annual profit relies heavily on 2 of our 6C learning behaviours, namely Commitment and Collaboration. The children were made aware that without these things, nothing is ever achieved in their school work and home life. Secondly, in revealing my two other childhood obsessions of Lego and Liverpool Football Club, I stressed to the children that they need a balanced range of interests and activities, no matter how much they may like one particular thing. I told them explicitly that a healthy life involves limiting their time on Fortnite, or coming off Roblox, and doing a range of indoor, outdoor and sociable activities during their free time. Sound advice, I hope, for a long Bank Holiday weekend.